For trucks and large vehicles carrying precious cargo, nothing is safer than sturdy, lightweight flatbed tarps. If you’re travelling and need protection of your shipment, a tarp for your truck or large vehicle is ideal. Lightweight tarps are great to have for all of your trip’s needs. It doesn’t matter if you’re a long-haul trucker or road trip warrior! Lightweight flatbed tarps preserve your cab or flatbed as well as what you’re transporting. Depending on what you drive, your lightweight tarp is able to be as big or small as you need to get the job done. Vinyl Coated: Vinyl coated tarps assist with the overall weight of the tarp itself. No matter the haul, the vinyl coated lightweight tarp’s uses extend over whatever cargo needs protection. Coated Polyester: Polyester flatbed tarps are traditionally lighter than standard vinyl tarps. This light tarp style handles many unpredictable weather and conditional elements with ease while remaining sturdy for long term use. Nylon: Tarps made from Cordura style nylon are great for any sort of distance driving with your shipment. This tough, high-tensile strength fabric has incredible abrasion resistance and will hold up against whatever is put in its path. The various flatbed tarp styles provide endless options for your travel needs. Whether you’re going the distance with machinery, steel, or lumber in haul or just helping someone move with priceless items in tow, a strong, lightweight tarp helps keep your items out of harm’s way. The best trait of this style of tarp is its lightness. Some flatbed tarps require heavy duty weight, but most flatbed tarps can be both light and remarkably protective. A lightweight tarp that protects like a heavy duty tarp seems uncommon. 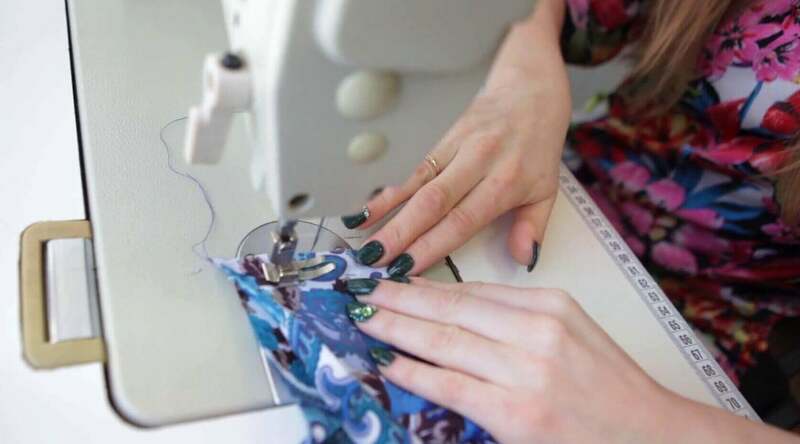 However, when tarps are made out of the right materials like lightweight vinyl or nylon, they carry interesting properties while maintaining their light weight. Consider our 14 oz. polyester coated flatbed tarp. This lightweight flatbed tarp is not only lighter than standard 18 oz. vinyl flatbed tarps, but it’s also waterproof and crack resistant! It has incredible abrasion resistance, which means no harm to your cargo or your tarp. Lightweight flatbed tarps are great for your peace of mind. Our tarp offerings won’t crack and break with temperature changes as you drive long distances. They also will take years to fade, as they’re UV resistant. Overall, lightweight flatbed tarps are ideal for every kind of trip that requires some extra protection of your goods. D-Rings: A row of d rings throughout your lightweight lumber tarp, steel tarp or machinery tarp assist in keeping your tarp in place as your drive the distance. Don’t let your tarp fly around without these secure rings. Grommets: Grommets surrounding your lightweight tarp also help keep it from flying in the wind. Secure your tarp using the grommets easily with tarp buckles. Tarp Straps: Tarp straps are essential when keeping your shipments safe. Using the tarp straps keep your tarp in place and your cargo secure. Winches: Winches help keep certain strapping from moving when driving. If you’re looking for a heavy duty option for a lumber tarp or otherwise, winches will ensure you’re straps stay unassailable and locked down. Cargo controls remain in your hand with the right accessories for your lightweight flatbed tarps. Overall, they are crucial to ensure your items are defended against any outcome. 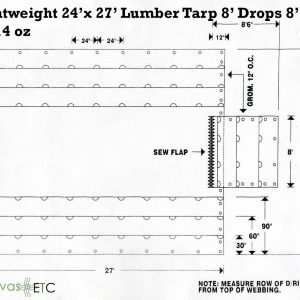 Flatbed tarps are perfect for their intended use, however they provide benefits for alternative use as well. Another primary use for these flatbed tarps are for coverings. 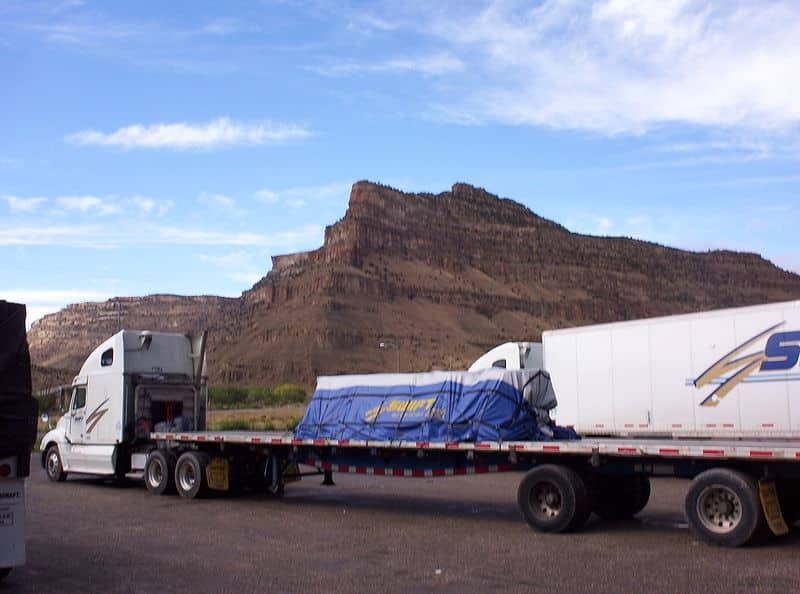 If you know you’re items will require long term protection in a storage facility, you can opt to use your flatbed tarp as a covering for your items. Cover important items like steel or lumber with your flatbed tarp to keep it good as new. Another use for your flatbed tarp also surrounds covering. If you are protecting your floor from abrasive furniture or cumbersome machinery, use a flatbed tarp. Their amazing abrasive resistance and high tensile strength will protect any floor. While flatbed tarps seem specific in use, whatever you’ll need covered or protected is also handled by its use! Overall, flatbed tarps are handy to keep around for a number of things. Canvas ETC. not only is your premier supplier of amazing and versatile fabrics, but also lightweight flatbed tarps. If you’re looking for variable styles of flatbed tarps or customization to your flatbed tarps, we’re here to help. Contact our team today, and one of our flatbed tarp experts will help assist in your every need.